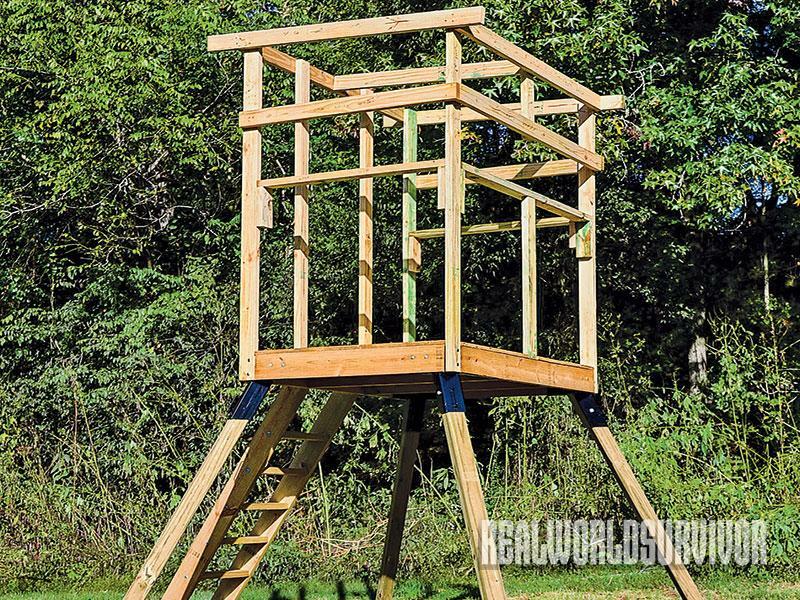 Stay high, dry, warm and ready to hunt in a comfortable DIY buck tower that you can make with a friend in just a few easy steps. 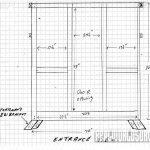 The heart of the permanent, two-man, elevated blind are the EZ brackets, frame and floor, which give you a good platform upon which to construct the blind. A jigsaw makes fitting the plywood floor into the frame easy. Since the frame is easier and safer to con- struct on the ground, disassemble and reas- semble on the elevated platform, marking the pieces of frame and plywood panels is essential for quick and easy reassembly. Before finalizing the height and width of the shooting openings, using the chair that will be used in the blind, check it out while being framed. The assembled frame just before being disassembled for movement to the permanent site. Setting the elevated platform so that it is level is important to the reassembly of the stand. ￼￼Steps are the first addition to the elevated platform to give easy access for final assembly of the blind. The framed blind after reassembly. Add cross braces to the blind legs as a safety precaution against separation or shifting later. The prepainted plywood panels being added to the frame. 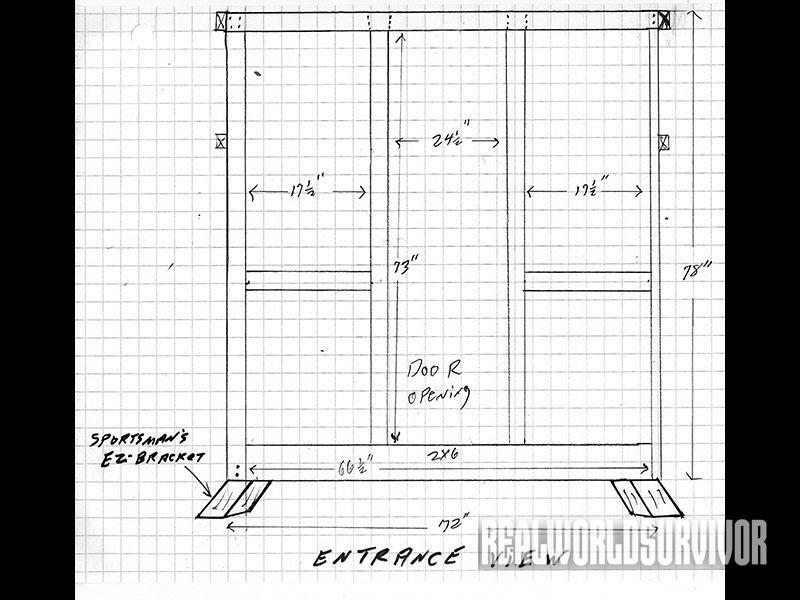 Entrance view blueprint of the buck tower. Front view blueprint of the buck tower. Side view blueprint of the buck tower. 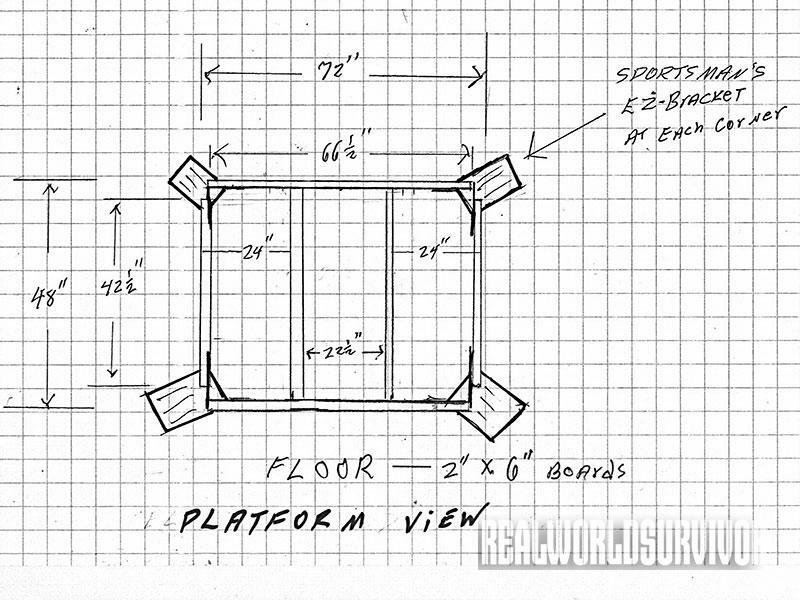 Platform view blueprint of the buck tower. 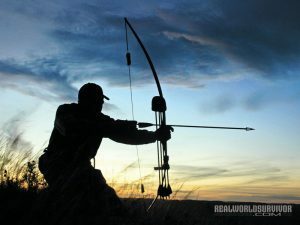 Having a well-built, permanent blind large enough for two people to comfortably hunt from, regardless of the weather, is high on the bucket list of many who own their own rural property, belong to a property-holding hunting club or have long-term access to private property. 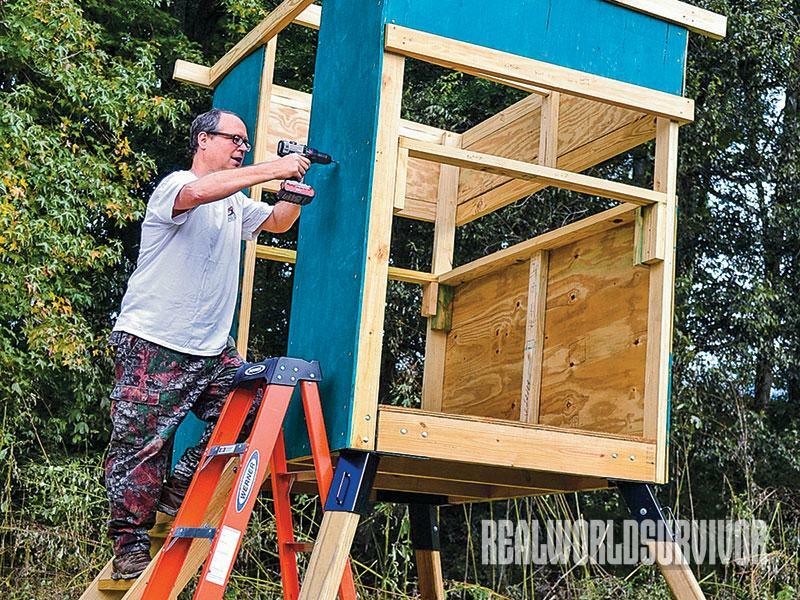 The two-man, elevated, all-weather blind is a great place to share a hunt with a child, grandchild, spouse, friend or a first-time hunter. Plus, it becomes a valuable part of the property. Soon after I purchased my farm, I found a location that, with a 7-foot elevated blind, I could see into one of my best food plots, a creek crossing used daily by deer, and into a wooded corridor often used by bucks moving from a bedding area to their feeding area. I wanted such a location to use for introducing my grandchildren to deer hunting and land management. 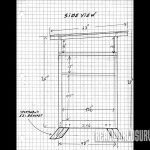 Not only did I want the blind to be elevated so as to see the various hot spots, but I wanted it to be a permanent blind built to shelter hunters from any kind of weather and to give years of service. 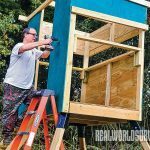 Before I decided on building the blind, I shopped for a sturdy two-man, ready-made blind that would meet all my requirements but quickly saw that they would cost in the $1,500 range. I knew that with the help of my sons, we could build a blind like I wanted for about half that amount. And with the proper annual maintenance, it would last for many years. 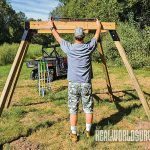 As I began to design the blind I wanted, I knew, since I had already located the site for it to be erected, that the floor needed to be about 7 feet above the ground. I wanted it to be roomy for two hunters, so I decided on making it 4 feet by 6 feet. I wanted it tall enough to be easy to get in and out of, so I designed it with a rear height of just under 6 feet and, with enough slope to shed rain easily, the front height of 51⁄2 feet. 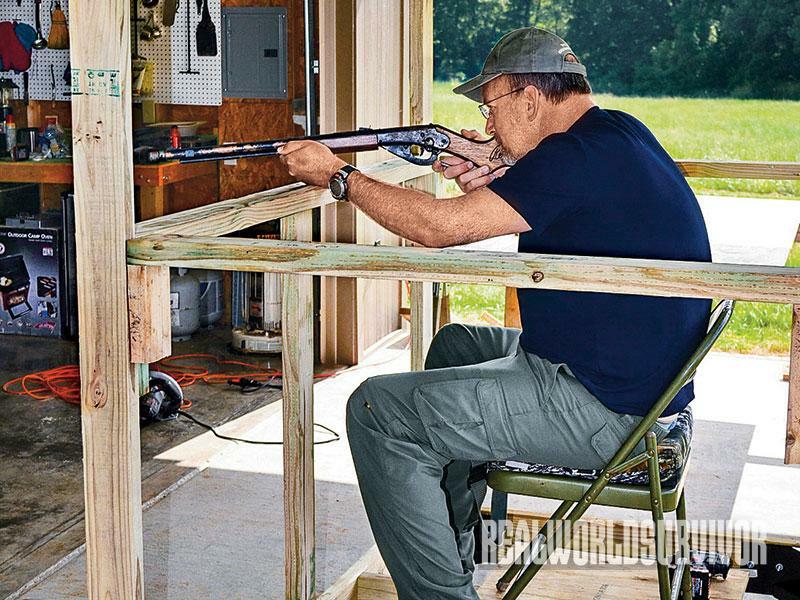 It would be framed in with treated 2x4s with a door frame for a 24-inch-wide door and three eye-level shooting openings that are 12 inches wide. 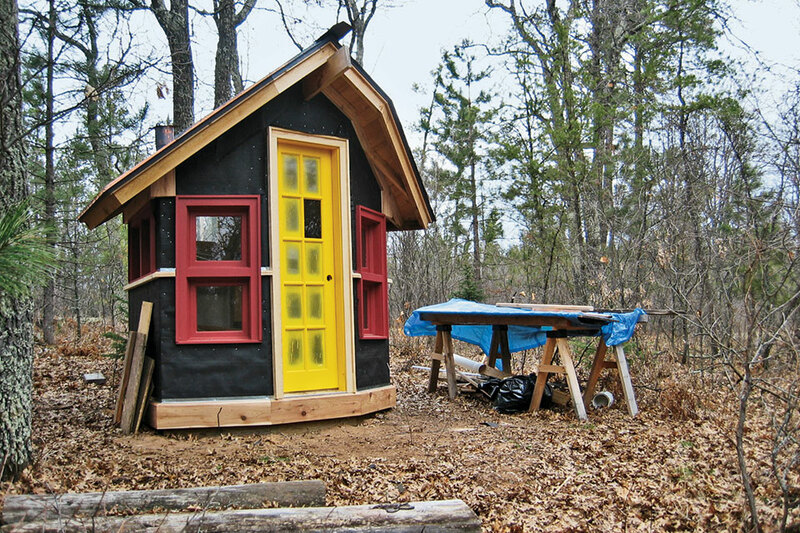 I elected to use a sheet of 3⁄4-inch exterior plywood for the floor, for extra strength, and 1⁄2-inch exterior plywood panels for the sides and roofing deck. The heart of my stand design is the platform upon which we built the stand. We started with Southern Outdoor Technologies EZ brackets (sportsmanscondo.com), which are well-designed, heavy-duty welded steel brackets. 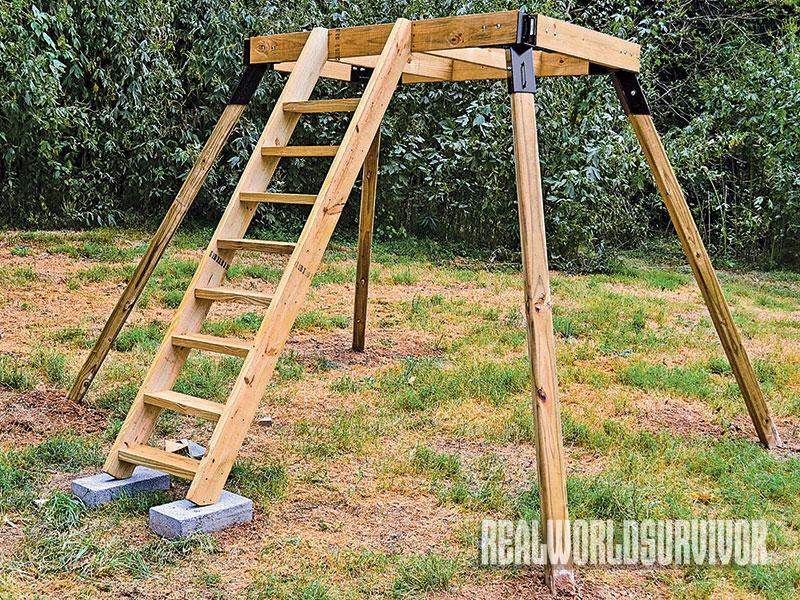 This places four 8-foot-by-4-inch- by-4-inch treated posts out at the proper angles for a safe, elevated blind. These brackets have slots and bolt holes to accept four 2×6 treated boards, to make a base that is securely bolted to the brackets with carriage bolts. 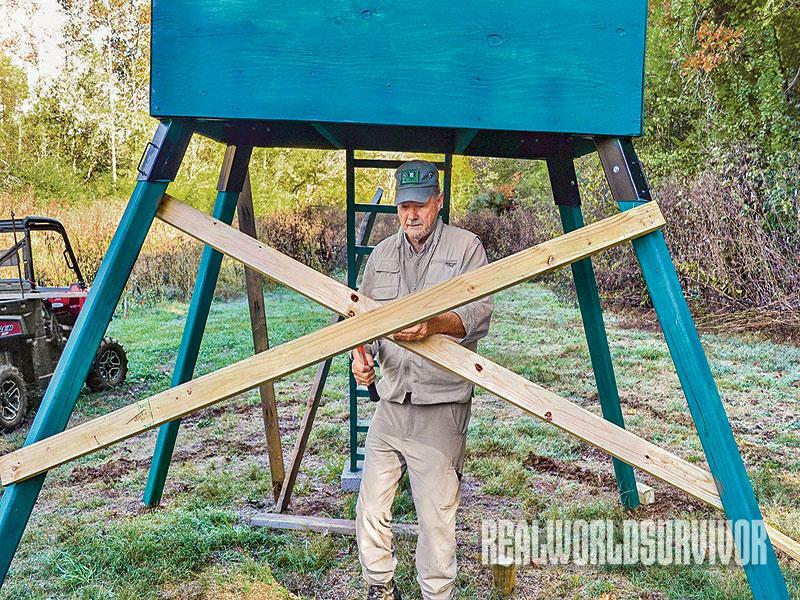 We would build a set of steps from treated 2×6 boards and add a handrail to enter the blind. The roofing material added to the plywood deck was a layer of roof underlayment and metal roofing screwed into the roofing deck. We painted the blind green with black stripes to blend into the creek bottom setting. We placed camo netting, loose at the bottom and sides, on each shooting position. 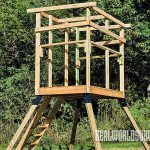 This enables the hunters in the stand to see out but not have the deer see in. First, a word of caution. 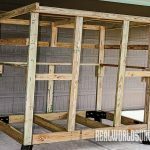 Since this is a heavy blind that is 7 feet above the ground, we found the safest way to build it is to pre-fab the platform and the blind on the ground, or as is my case at my shop, marking each piece as you build, then disassemble the blind. Take all to the components to the blind site and reassemble, using caution when raising the platform up on the 4x4s. More on this to follow. The EZ brackets make building the platform quick and easy. Cut one 2-inch-by- 6-inch-by-8-foot treated board into two 42 1⁄2-inch-long pieces. Then cut two 2-inch-by-6-inch-by-8-foot treated boards to 66 1⁄2-inches. 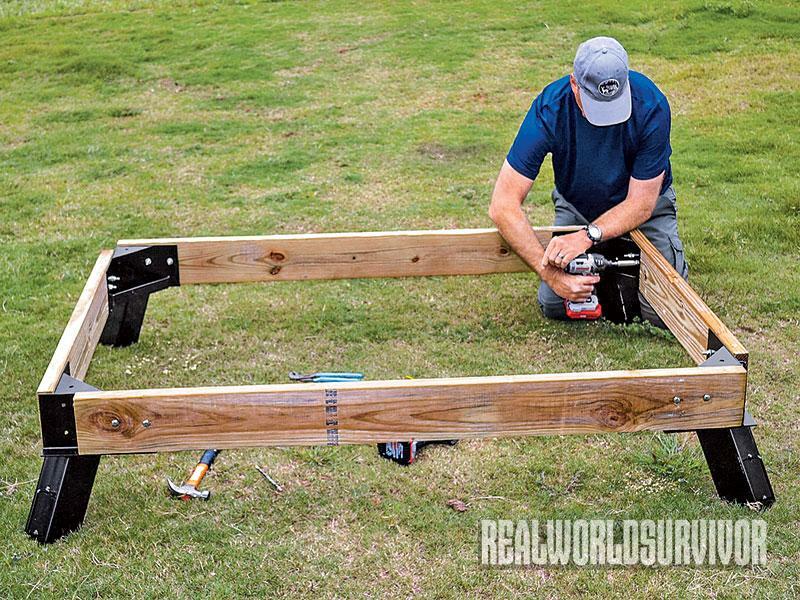 Cut one 2-inch-by-6-inch-by-8-foot board into two 45-inch pieces for floor joists. 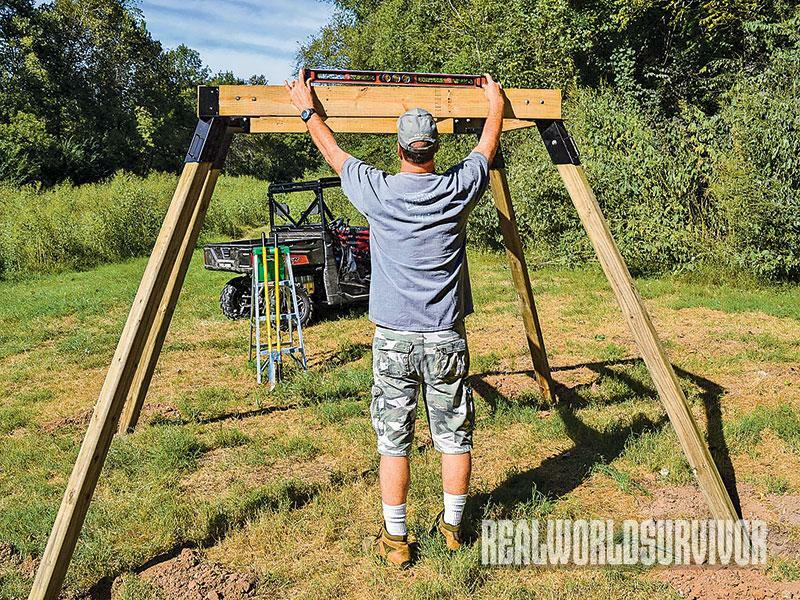 Align each 42 1⁄2-inch and 66 1⁄2-inch piece with EZ brackets using guide pockets to create a 4-by-6-foot frame. Mark bracket holes on the boards and drill holes. Secure boards to EZ bracket using 5/16-inch carriage bolts, washers and lock nuts. 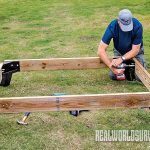 Install floor joists inside the frame using 3-inch lag screws. 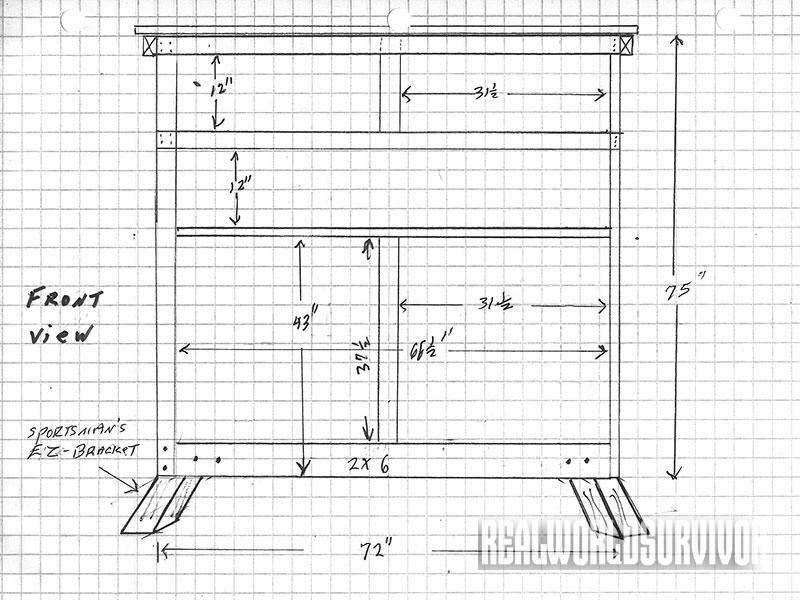 Next, cut the 3⁄4-inch-by- 4-inch-by-8-foot plywood with a circular saw into a 4-by-6-foot sheet. Using a jigsaw, cut out 2-by-4-inch openings for the four corners and 2-by-4-inch vertical supports for the blind framing. 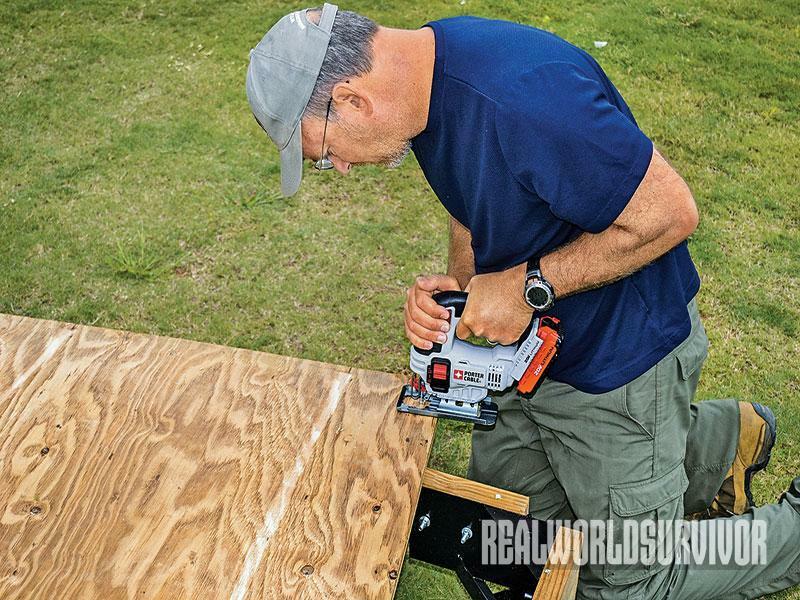 Secure the floor to the platform base using 3-inch deck screws. The platform base is ready for the blind to be framed on it. Note: You will want to number/describe each piece of the blind from this point on, as it will be disassembled and reassembled when the final blind is put together on site. 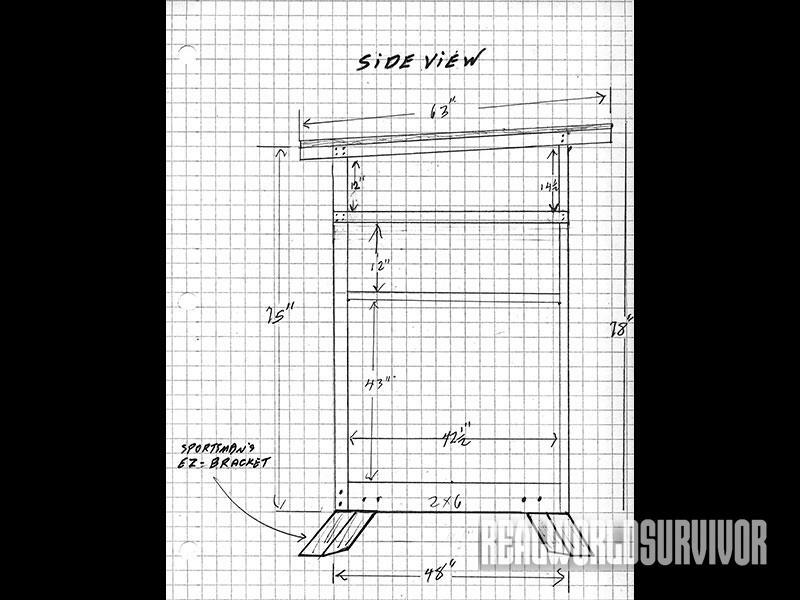 To attach the blind frame to the platform, cut two 2-inch-by-4-inch-by-8-foot boards to 78 inches in length for the high side of the blind, and cut two boards to 75 inches for the low side. Using a framing square and long level, make sure each corner is vertical. Mark holes and pre-drill. Bolt these corner boards into the EZ bracket using 3⁄8-by-16-by-3-inch carriage bolts with washers and hex nuts. 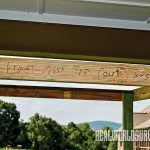 Mark the angle of the roof line using chalk line, from the back corners of the rear framing (tall side) boards through back corners of the front framing (short side) boards. 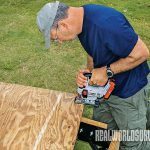 Cut angles with a jig or circular saw. Do the same for the center rafter. 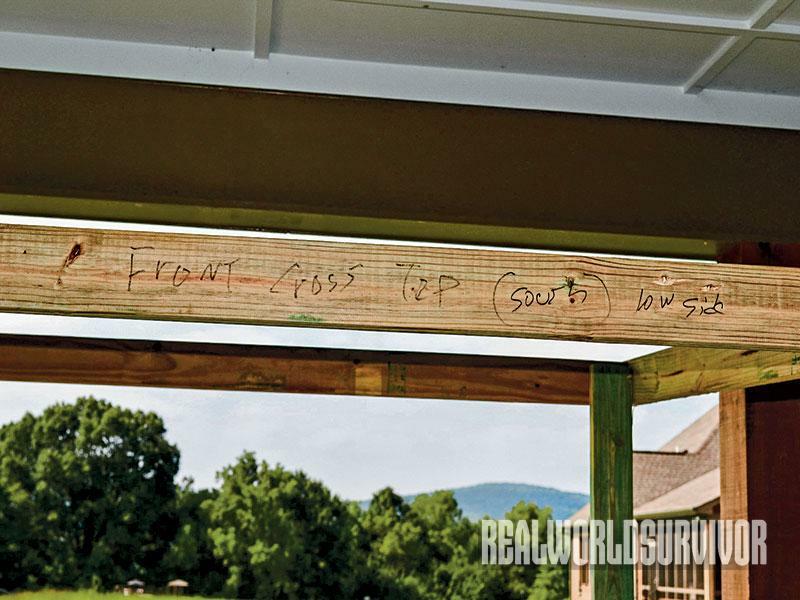 Install 2×4 framing around the top and secure the center rafter with 21⁄2-inch deck screws. Frame in door. 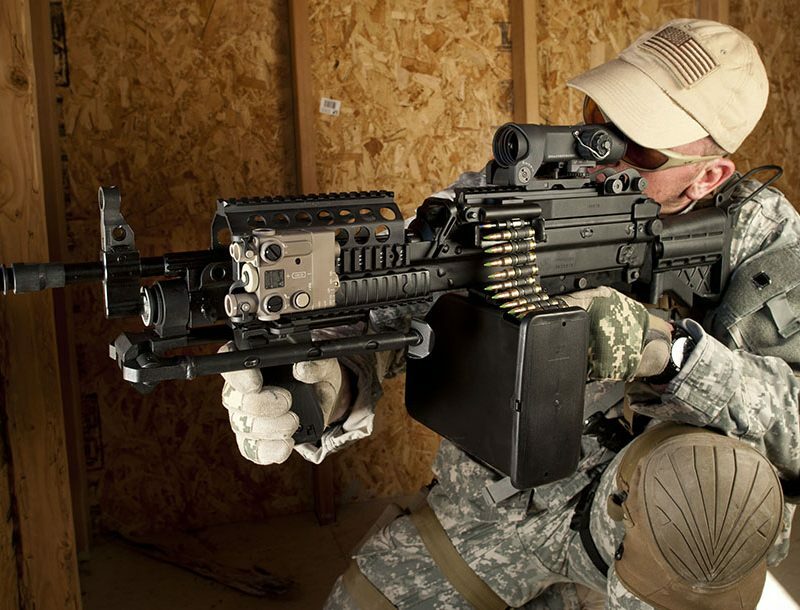 Attach the center support for the front shooting window. 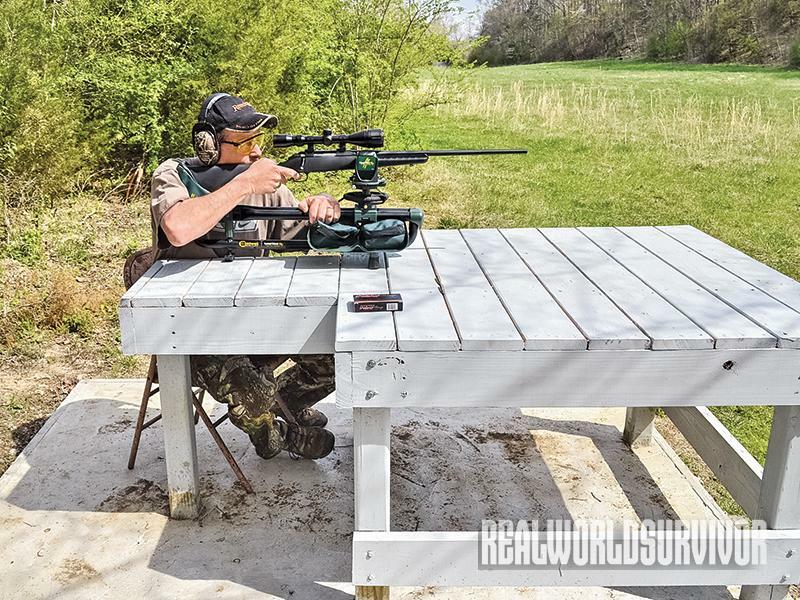 Next you will want to make sure the shooting opening is the right height for the chairs and shooters who will be using the blind. 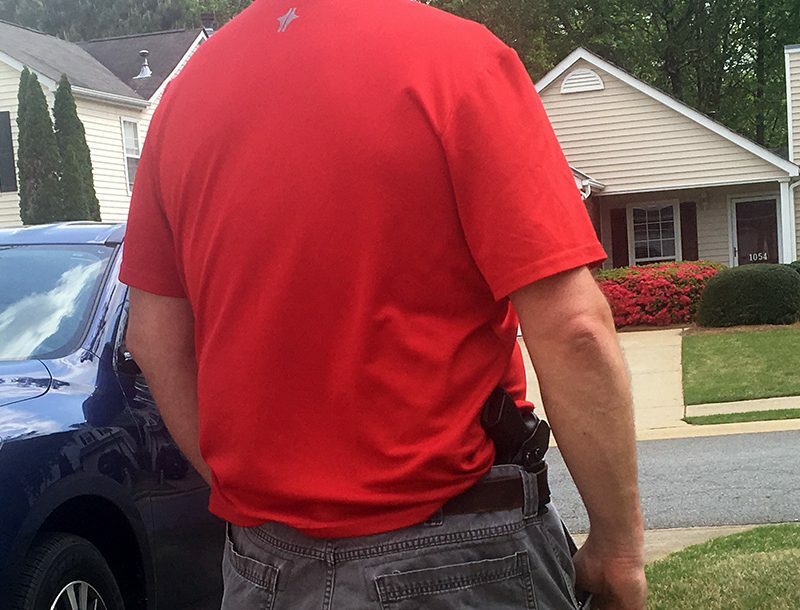 Actually have the shooter sit in the chair to make sure of the height. 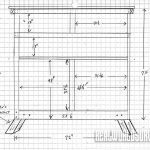 Ours is 39 inches as shown on the plan. Also, you may not want a 12-inch opening on the shooting openings. Now is the time to adjust that for your personal taste. Next frame in horizontal boards for shooting openings and back wall supports. Install the upper vertical support for the center of the front shooting opening. 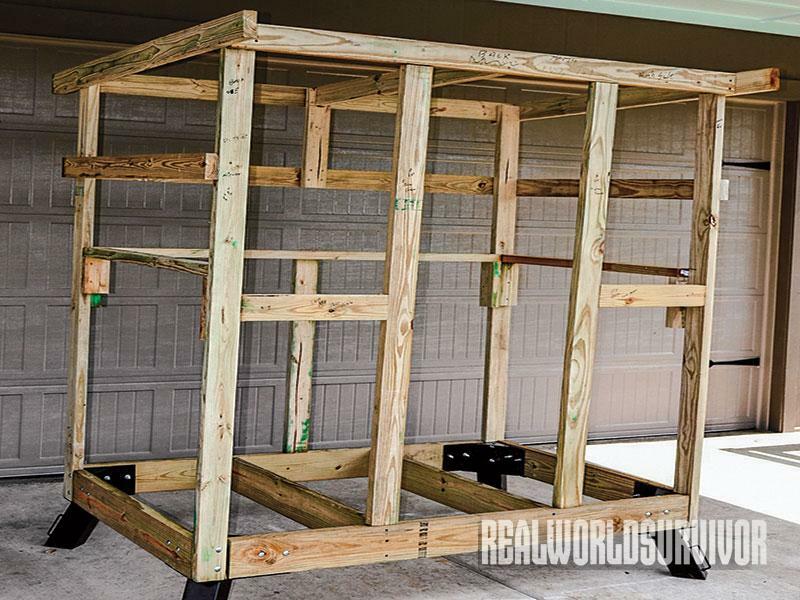 Now that the blind is framed, cut panels from 1⁄2-inch plywood to cover the front, back and sides. Use deck screws to attach. Do not forget to number/describe all parts for reassembly. We used a scrap piece from the 3⁄4-inch plywood floor to make one side panel. Also, we decided to paint the panels green while they were easy to reach. It saved time. It also made it easier to paint the blind when it was reassembled above the ground. Finally, cut one piece of 1⁄2-inch plywood 63 inches by 72 inches for the roof. There is an overhang at the front and back of the roof. The blind is now ready to be carefully disassembled, except for the platform base and floor, and moved to the site of its permanent location. Once there, slip the 4-by- 4-inch post in the EZ brackets and attach with a lag bolt in each bracket to hold it in place. With plenty of help, and being very careful, roll the platform into the position you want it to sit permanently. Mark the ground and dig holes 12 to 24 inches deep. Sit the platform legs in the ground and check the platform to be level in all directions. Make adjustments by digging until it is level. Mix and pour in one bag of Quikrete per hole. Allow it to set up for 48 hours. 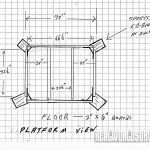 Once the platform was securely anchored in concrete, using the remaining four 2-inch-by-6-inch-by-8-foot treated boards, we made a set of steps that attached with lag screws to the platform in line with the center of the high side of the blind. This made getting on the platform to reassemble the blind easy. It took two of the boards to make the runners and the other two to make the nine steps that were 20 inches wide and 71⁄2 inches apart. We secured each step in place with four 3⁄8-by-3-inch lag bolts with washers. The slope of the stairs is optional. We made ours 60 degrees since it was going to be used by young and elderly hunters. However, many who build elevated blinds simply make a 90-degree ladder for the entrance. 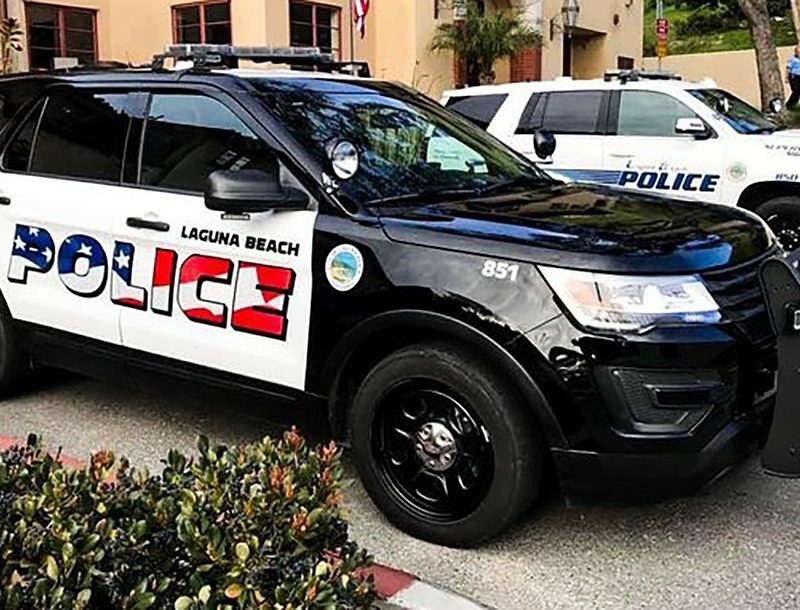 We placed the bottom of each runner on a 4-inch-by-4- inch-by-16-inch concrete support block to give the steps a long life and to give it a firm footing. After completing the blind, we also added a handrail to the steps made from scrap 2x4s. Starting with the corner boards, we reassembled the blind in the same order we built it on the ground, thanks to the marking we did on the pieces of the framing. Since the blind was 7 feet above the ground at the floor, it was necessary to use ladders for much of the reassembly and caution was used to prevent anyone from falling. Once the roofing deck was secured to the top of the blind, we stapled two sheets of roofing underlayment in place. Next, using a circular saw with a metal cutting blade, we cut the galvanized roofing into two pieces to fit the roof. 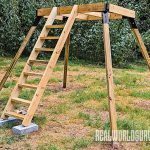 They were attached to the decking using washer-equipped roofing screws. 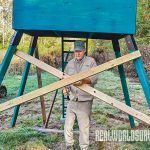 To assure that the elevated blind was well braced, using 2-inch-by-6-inch-by-8-foot boards in an “X” shape, we screwed them to the 4×4 legs, one side of the cross on the inside of the 4×4 post and the other on the outside. Where the lumber crossed there is a 4-inch space. We used scrap pieces of 4×4 to screw in the X-shaped boards at this point. As with the stairs versus a ladder as mentioned above, there are many options with an elevated, permanent blind. Some people like to leave the door space open. Since the door side of our blind faced north, we wanted a door to stop cold winds, so we used scrap 1⁄2-inch plywood complete with hinges, handle and a hook-and-eye door latch. I have seen many blinds of this type simply hang a tarp or heavy camo fabric over door openings. 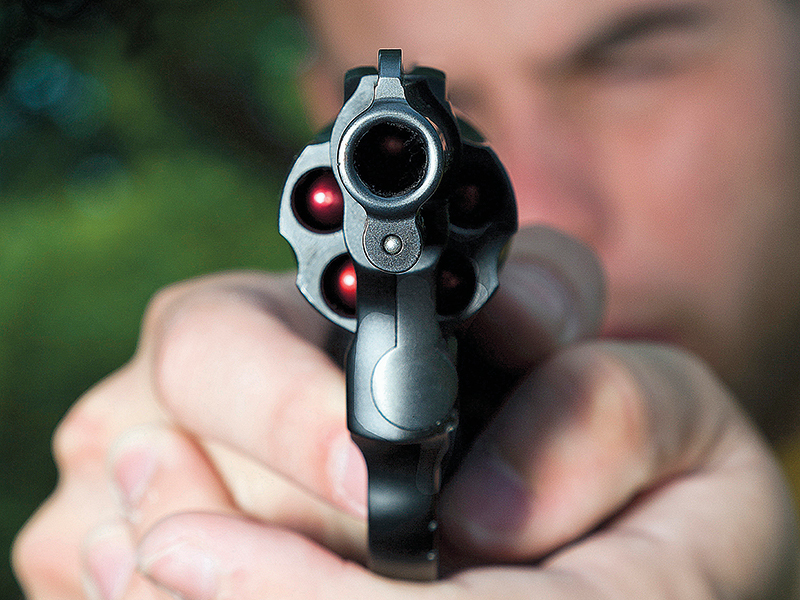 Another option is how to treat the shooting openings. Some hunters place hinged Plexiglas on the openings while others do nothing. We elected to hang camo netting inside the blind and allow it to drop down enough to cover the opening. They do blow when there is a wind. However, since the blind becomes part of the landscape, deer soon get used to the movement and pay little attention to the flapping camo netting. Blinds of this type can be insulated for warmth. They can even have a small gas heater to keep the hunters warm. We elected to not go this far with ours. Once the blind is built and painted, all that is needed is to add a couple of folding chairs and cushions and you are ready for hunting season to open. Blinds of this type are also a valuable asset to any rural property beyond hunting, as they can be used to study wildlife, for wildlife photography or as an emergency shelter in bad weather. 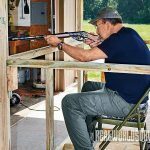 This article is from American Frontiersman magazine. Subscriptions are available at OutdoorGroupStore.com.